Bill Doherty, author, family therapist and professor in the Department of Family Social Science, delivered the CEHD Graduate Commencement address. Photo by Julie Michener. 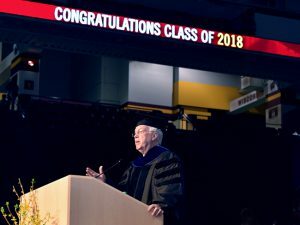 Bill Doherty, professor in the Department of Family Social Science, delivered the address at the College of Education and Human Development’s Graduate Commencement Ceremonies Thursday, May 10. An educator, researcher, couple and family therapist, author, consultant, and community organizer, Doherty joined the University of Minnesota’s Department of Family Social Science in 1986, and has been a leader in preparing professionals for effective democratic engagement and conducting community-based research projects that advance knowledge and solve local problems. Developing his Families and Democracy Framework, Bill has been testing his theories over the past year in workshops with the non-profit, Better Angels, that build bridges between “red and blue” citizens in communities across America. Citizens on both sides of the divide enter Bill’s workshops polarized and defensive, and leave connected, transformed – healed. In his remarks, he discussed this recent work and challenged graduates to join him in this work. I’m sure you’ve noticed that the political world has changed since you entered graduate school. We are now in the throes of a political polarization that some historians believe is the worst we’ve seen the 1850s. And it didn’t start in November 2016. The last presidential election brought to a head a process that has been coming upon us for at least 50 years. I’ll give just one data point as an illustration: In 1960 5% of Americans said they would be uncomfortable with their son or daughter marrying someone of the other political party. Now that figure has reached 35-40%. Today Americans increasingly view their political opponents not only as misguided, but also as bad people whose ways of thinking are both dangerous and incomprehensible. This current degree of civic rancor between red America and blue America threatens our families, as people pull away from family members who vote another way, and our democracy itself, which is based on our ability to work together across differences for the common good. The United States is disuniting. How’s that for an upbeat start to a commencement address? So why do I come today filled with the hope that we can get past this polarization and with the conviction that individuals with the training you’ve had in this College can make a difference? For starters, education and human development are fundamentally about relationships. As much as anything else, your graduate degree is in how to form and nurture productive relationships, without which our specialized academic knowledge is barren. Relationships are the natural antidote to polarization because polarization (and I would add other social ills like racism) is sustained when we don’t know one other, when we don’t have civic friendships, when we stay in our silos, watch our favorite media, and talk about the other group and not with them. Of course there is a long way from this generalization about relationships to actually moving the needle towards depolarization, especially when our news feeds constantly inflame us and our Facebook contacts spout what we see as dangerous nonsense. How do we design settings or containers where people with different political views can come together in a productive way? I’ve been involved in such a project, called Better Angels (after Lincoln’s phrase “the better angels of our nature”). Better Angels is a grassroots citizen’s initiative bringing red and blue Americans together in a working alliance to depolarize America. It took off after the last election when we decided to bring together 10 Clinton voters and 10 Trump voters for a weekend in southwest Ohio. My job was to design and facilitate the gathering, and to say that I was nervous would be an understatement. I quickly realized that the goals had to focus on understanding each other beyond stereotypes and looking for common ground, and that the process had to be highly structured and feature listening and learning rather than declaring and debating. Well, the workshop was successful beyond our expectations and it launched a small movement. Since that first workshop, Better Angels has gone national, with three hour and six hour workshops happening in 24 states, some of them leading to the formation of Better Angels Alliances, groups of Republicans and Democrats working together to promote depolarization in their communities and to advocate for policies where they have common ground—like gerrymandering and money in politics. We have one of those red/blue alliances in Minnesota. I’ll tell you just one story from the Ohio workshop. Greg Smith came as pro-Trump, white Christian conservative determined to convince others to support Trump, and Kouhyar Mostashfi came as a Muslim Iranian immigrant Democrat with fears that the country could turn violent because of forces now unleashed. Well, Greg and Kouhyar ended up sitting next to each other during the workshop. By the end they had agreed to visit each other’s houses of worship. They are now co-chairs of the Southwest Ohio Better Angels Alliance and will be featured in a forthcoming PBS documentary about that workshop. They are still a conservative and a liberal but with a common cause to rebuild the civic fabric of their community. On this occasion as we celebrate the attainment of a graduate degree in the College of Education and Human Development, I want to challenge the graduates to create containers or processes in your classrooms, counseling offices, and community centers for a kind of diversity that we’ve not emphasized very much until recently—namely, political diversity. How can we create environments that allow conservatives and liberals, reds and blues, to engage each other productively, with both sides feeling respected? Among other things, it will mean understanding that many of our favorite terms have become “colorized” in today’s environment. Some of us frame goals in terms of diversity, inclusiveness, and social justice—all good things, but thoroughly blue in language and therefore alienating to reds who fear that the starting premise will be that they are racists—and then let’s work together from there. The shoe would be on the other foot if blues were invited to a conversation based on the language of love of country, the American experiment, and self-responsibility. I’ve learned that productive conversation in a polarized environment cannot start with my insistence that the other side accept my preferred terms for what we are here to do. Now this depolarization work is not just in classrooms and workshops; it’s in our hearts and minds as well. My question for all of us here today is this: How do we personally regard our fellow Americans who differ from us strongly in politics and public policy? Maybe you’ve heard the adage: Choose your enemies carefully, for you will become like them. Stated differently, if you demonize another group, you distort yourself and begin to look like a mirror image of them. When we train moderators for Better Angels workshops, we ask them to self-assess their own emotional attitude towards the people on the other side of the political spectrum. I invite you to think about where you are on a spectrum of attitudes I’ll describe. Keep in mind that this not how you may feel about an individual political leader but about the bulk of people on the other side—the over 40 million people who voted the other way in the last election. The first attitude is hatred toward a group who are out to destroy the country. I hope that’s not where most of us are with regards our fellow citizens. The second attitude is more common: disdain for people who are ignorant and misguided—and who should know better. The third attitude is pity for others who have good intentions but are ignorant and led astray by bad leaders—and who need to be enlightened. The fourth attitude is basic respect: others who disagree with me have rational views but ultimately theirs is not the right approach to solving our nation’s problems. The fifth attitude is respect and appreciation: the other side has views that need to be included in the ultimate solutions. I’m convinced that we only shift in the direction of respect by first seeking to understand others as they understand themselves, and then telling them what we think. As a family therapist, I’m trained to understand people who are locked in conflict, but the challenge in the public arena is that I’m part of the conflict. I do have a dog in this fight and I’m scared for the future of our democracy. But I believe in my heart that most Americans really don’t really want a civic divorce and, when offered the right container for conversation and relationship building, will choose to access the better angels of their nature. There is lots of work ahead. As I said, today’s polarization didn’t start with the current President. It came from many sources that gradually tore the social fabric, with groups feeling left out and left behind, with our growing distrust of one another and of our social institutions, including colleges and universities.